How can I install a snapshot on a different VPS? It is possible to install a created snapshot on another VPS with similar or better specifications by following the steps below. Select the tab 'BladeVPS' in your control panel. On the left-hand side of your screen, click the name of the VPS you want to use to install a snapshot ON. Click manage in the top right, followed by the button labeled 'Snapshots'. Please note that you have to select the VPS you want to install a snapshot on, not the VPS whose snapshot you want to use. 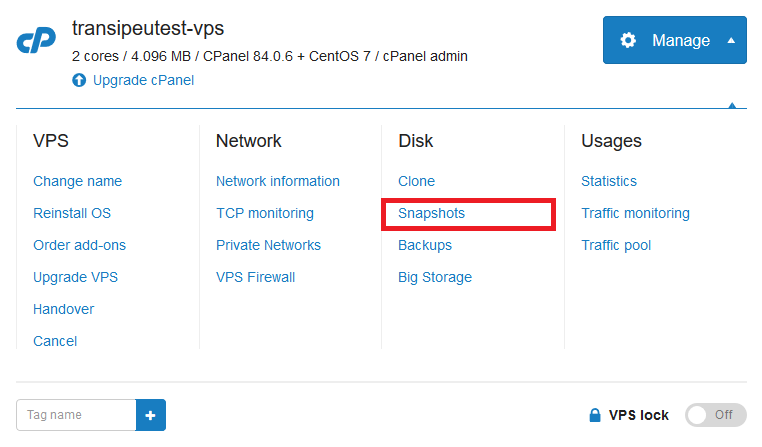 On the top of the snapshot page you will see an overview of the available snapshots for the selected VPS. Below it, you will see all the available snapshots from other VPS's. Because of the disc-space requirements it is not possible to use the snapshot of a larger VPS on a smaller VPS. The label VPS too small is shown when the current VPS is too small for the snapshot. Select 'Restore' on the right-hand side of the snapshot to restore the snapshot on your VPS. Depending on the size of the snapshot, it can take some time before the VPS can be used again. A snapshot can not be restored on a VPS with an active 'lock'. Because of the the SSD disc-space requirements, it is not possible to restore a snapshot to a VPS with less disc-size. If you configured the IP addresses on your VPS statically, you will not be able to use the network-connectivity of the new VPS yet, as it will also restore the network-configuration. Because you can not use the original IP addresses, you need to first manually alter the network-settings and configure the IP address(es), before allocating the new IP addresses and remove the existing ones from the restored VPS.